Creative, professional design differentiates you from your competition, establishes brand equity, and builds loyalty for your products and services. Our design team creates graphics that complement and uplift your brand. Creating artwork for 3-D objects is a unique design process. 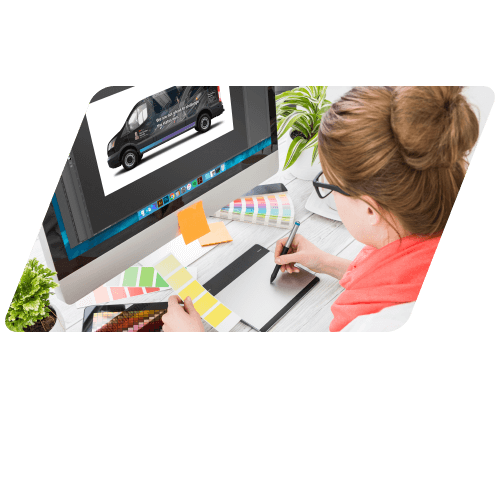 Our team specializes in producing graphics that showcase your brand and complement the shape of the vehicle. Stand out in a crowd with unique signage created by our team. Whether it’s a company event or tradeshow, we can help with banners, booths, signs and more. Along with highlighting existing brands, our design team can develop new branding from the ground up. Our team understands the quality and speed needed to stay on a production schedule. We design set elements quickly, so you can be a step ahead.